Gene Black an Alabama Artist and Quilter: A Sneak Peek! I know I haven't posted in over a week. I am sorry. There have been several things that have happened in my life that I just can't talk about right now. Just know that I am still here. Now, Let me give you a bit of a sneak peek at a quilt that will be my April Island batik challenge quilt. The fabrics were all provided by Island Batik as a part of the Ambassador program. This is a baby quilt but it has a more modern aesthetic. The sashings, cornerstones and setting triangles are in gray, black, and white. Since it is a baby quilt I did more casual quilting on it also. I really like the two color pieced binding in red and blue. It adds a nice pop of color to the edges. Hopefully in a few days I will be able to get good photos of the quilt and post them for your enjoyment. I liked the binding A LOT before even reading what you wrote! 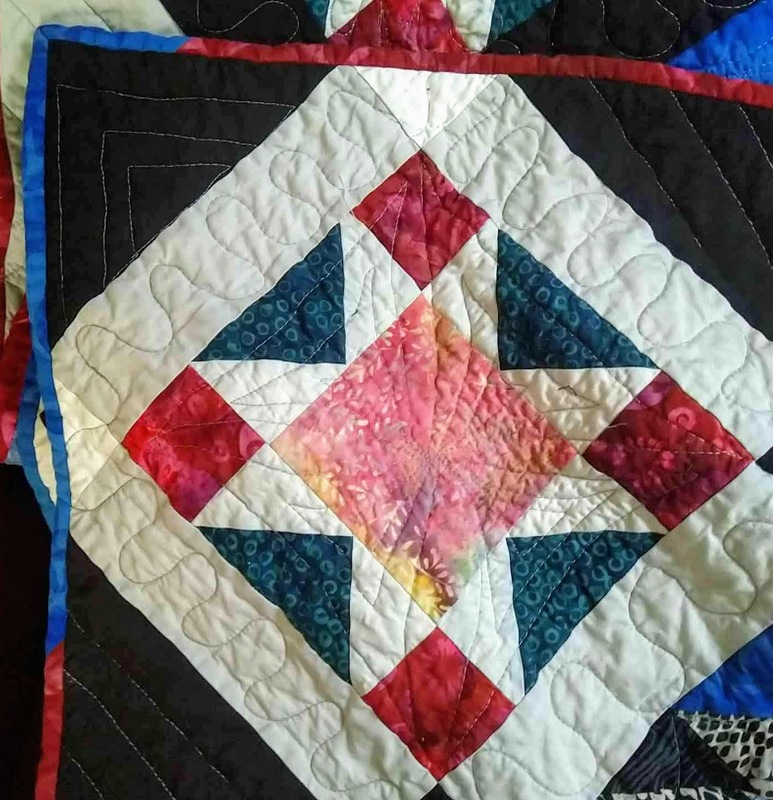 That’s not to say it takes away from the entire quilt. Itis simply beautiful in its totality, an awesome creation! April Challenge: Island Batik and Accuquilt Go!